Our club has operated our current food van since 1994. It has been hired by many groups within the Pine Rivers area, and has proven to be a great fundraiser for the club. For some time we had recognised that the small steps used to access the rear of the van were not satisfactory. 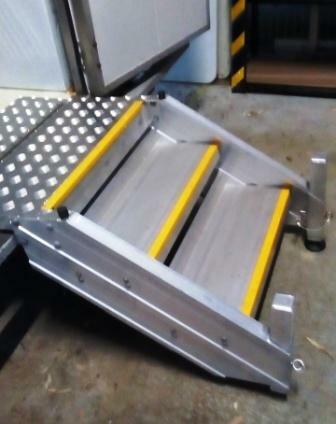 Now, with the assistance of a workplace safety company, we have secured a new set of safe steps for the van. This will make access to the van much easier and safer. Thank you to Workplace Access & Safety for your generous assistance with the steps! Our club members are dedicated people who share a passion for both community service, friendship and fun. Becoming a Rotarian connects you with a diverse group of professionals who share your drive to give back - locally and internationally. All materials and photos, unless otherwise specified, copyright of Rotary Club of Pine Rivers.